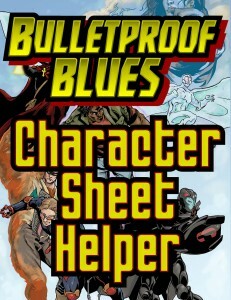 We are pleased to announce the official release of Bulletproof Blues on DriveThruRPG! The print versions should be available on DriveThruRPG and Chronicle City soon. Here’s a graphic from the Creation section of Bulletproof Blues. We are pleased to announce the official release of the Creative Commons and Open Game License versions of Bulletproof Blues! The PDF and print versions should be available on DriveThruRPG and Chronicle City soon.